Our international rugby team concluded the previous decade, the start of the professional era, under none other than Warren Gatland, with a fourth-place finish in the final edition of the Five Nations. With just one win from four games, Ireland's minuscule advantage on points difference (-24 to -25) kept them above the French and ensured that the millennium would not be drawing to a close with four successive Wooden Spoons, which would have been a first for our international team. 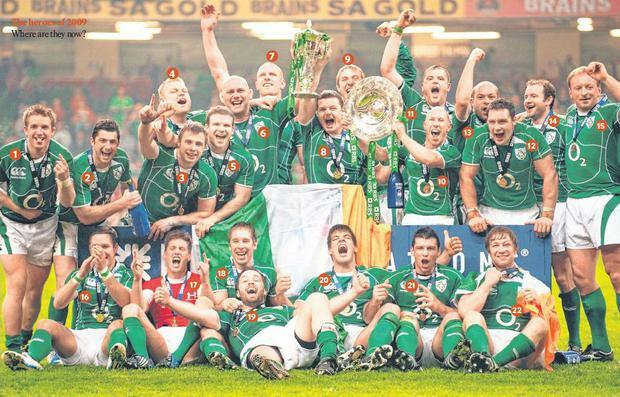 Ten years after limping into the Six Nations era, the so-called 'golden generation' of Irish rugby were collectively craning their necks underneath the arc of a Stephen Jones penalty that seemed to slow the hands of time. Almost hypnotised by the dizzying revolutions of the long-range penalty, delirious scenes broke out on and off the field once Geordan Murphy launched the ball into the stands to confirm that the kick had actually fallen short. I had one of the best seats in the house, but it wasn't where I wanted to be. Being togged out near the coach's box, beside Girvan Dempsey, in case of a last-minute injury, was something I had become used to during that Six Nations, but I could have no real complaints about the team that was being picked by Declan Kidney. The starting back-row of Stephen Ferris, David Wallace and Jamie Heaslip were all world-class, and Denis Leamy offered plenty of fiery impact and versatility from the bench. Few sporting events I've attended have come close to matching the 2009 Grand Slam decider for drama; the piercing pitch of the crowd reaction to ROG nailing his 77th-minute drop-goal is something I will never forget. When our fly-half wheeled away in celebration I glanced back towards Declan Kidney and saw a man desperately trying to keep things together - the swan's legs were starting to ripple the water. The collective Irish groan when the penalty was awarded against Paddy Wallace minutes later pinballed thoughts about unfulfilled potential, flashbacks to clear-the-air meetings in Enfield, and the prospect of the 61-year Grand Slam wait ticking on for at least another 12 months. Thankfully, those negative notions never got an opportunity to fester and before I knew it, myself, Girvan and Shane Jennings were being ushered on to the field by team manager Paul McNaughton to join the celebrations. I was delighted for these guys that I knew so well but I did my best to shyly make my way to the side of the podium, out of the spotlight. I had trained in the camp for the previous six weeks, trying to be the best tackle-bag holder that I could, but this was a moment for the coaching staff and the 22 players who were named in the squad that day. I may have had my tracksuit on but there was no danger of a John Terry moment. I received my medal, and the consequential good-natured ribbing from John Hayes - "what did you do to deserve that?!" - before doing my best to move back stage. We will never truly know the significance of that Stephen Jones kick falling short, but as we reflect, 10 years on, about a moment in Irish sport that left an indelible mark on so many people, its significance, and more importantly the achievement of that 2009 team, remains so relevant today. The sea change in Irish rugby was largely driven by the players, who would then flourish under the structures that were implemented. Declan Kidney could see the Grand Slam jigsaw taking shape in 2009; all of his edge pieces were in place but he knew he needed to tackle some key organisational tasks before attention could be switched to the finer details to complete the puzzle. Assembling such a well-balanced coaching ticket and recognising the various qualities that Les Kiss, Gert Smal and Alan Gaffney would bring to the operation took great vision, as did the understanding that the bubbling provincial rivalries were threatening to hinder the performance of the national team. The mentality of Irish rugby players shifted seismically the day Brian O'Driscoll touched down three times at the Stade de France 19 years ago. It was no longer good enough to turn up to matches and give it a lash. The demands grew after the game turned professional and it took some time to adjust. It could not be done with the flick of a mental switch, it was a gradual, learning-assisted process. We found out in 2003, in the mauling by England in a Grand Slam decider, that we still had plenty of mental development to do. Martin Johnson's bullish side arrived in Dublin brimming with confidence, certain that they would be completing the clean sweep. 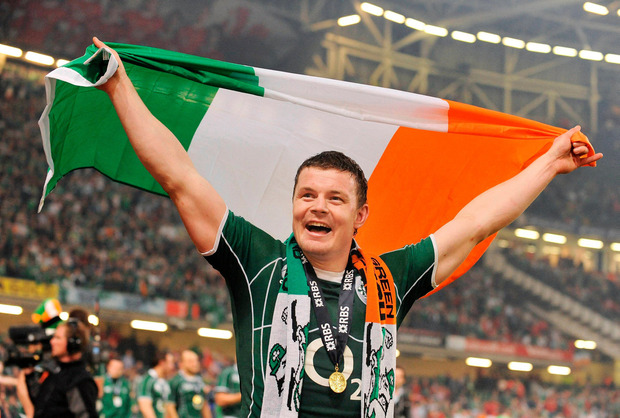 Six years afterwards Brian O'Driscoll addressed his players at the Millennium Stadium, imploring them to seize the day, insisting that it was now or never for the men circling him, that Irish rugby desperately needed this. It was a game that could have an impact for years to come. We now have a fearless new generation of players - many of whom were of an impressionable age when finishing their primary-school years or beginning second-level education in 2009 - that have blossomed before their spring, picking up one Grand Slam and ticking plenty of other bucket-list items for an international rugby player along the way. I suspect it is no coincidence either that the likes of Garry Ringrose (24) and James Ryan (22) possess so many similar traits to their likely respective idols - in skills, attitude and even body language - Drico and Paulie. That is the kind of effect that those inspirational figures had on our budding rugby players 10 years ago. Even in the case of ROG and Johnny Sexton, while they may be closer in age and the latter would have got more hands-on advice, and an earful or two, from his Munster rival, you can be certain that seeing a fiery Irish No 10 achieving what O'Gara did had a profound impact on the reigning World Player of the Year. It speaks volumes for how far Irish rugby has come in the last 20 years that we are heading into a final-round Six Nations clash in Cardiff in the mix - granted, just about - for a Six Nations title, and the campaign still feels a touch underwhelming. Yet the cyclical nature of sport, even with the healthy state of the provinces and the international team at the moment, ensures that there will be plenty of disappointments ahead for the current cohort who have tasted so few defeats in their first 10 or 20 caps. It is not just the good days such as March 21, 2009 that we have learned valuable lessons from, but also the major disappointments such as the 2007 World Cup, and coming so close to ending the Grand Slam drought on a couple of occasions. So much emphasis has been placed on Japan that it has the potential to even knock what may seem like an unshakeable confidence among players like Ringrose, Ryan, Dan Leavy, Andrew Porter, Joey Carbery, Jacob Stockdale and Jordan Larmour. Win, lose or draw in Cardiff today, there are guaranteed to be bumps on the road for the rising generation of international players in this country. We can demand better but we mustn't fear failure. The 2009 team moved the goalposts for Irish rugby in the professional era, the current crop must strive to keep pushing them even further. 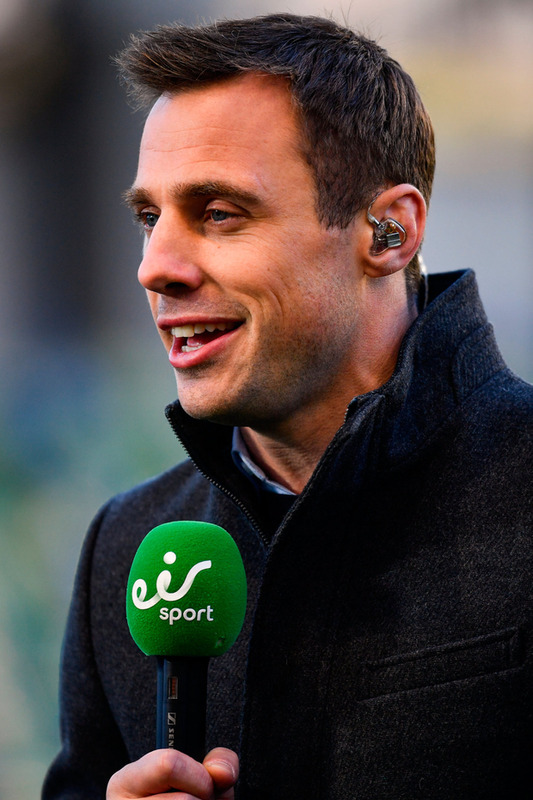 Now: Injury cruelly cut short Fitzgerald’s career and, since then, the one-time prodigy has gone on to co-host Independent.ie’s weekly rugby podcast The Left Wing, while also regularly appearing as a pundit on Eir Sport with Tommy Bowe. Fitzgerald also juggles his media commitments with his full-time job in AIB, as he looks to climb the ladder in the world of banking. Now: Restored to the starting line-up for today’s clash, Kearney has seen off several contenders and remains Ireland’s first-choice out-half. The 32-year old is currently assessing his options as his current contract with the IRFU runs until the end of the World Cup. Kearney is likely to attract interest from overseas but may well be tempted to remain at home, where he is also chairman of Rugby Players Ireland. Now: Bowe heads up Eir Sport’s PRO14 coverage as he swaps sides of the microphone. The Monaghan native has been a steady hand and continues to improve in what is a very different role for him. He still ranks second on Irelands’s list of all-time top try scorers (30), although Keith Earls has a chance to go ahead of him today after drawing level last weekend. Bowe also runs his own shoe and clothing brand. Now: Moved home to Australia after eight years in Belfast as he became a performance consultant with Surf Life Physio. Court is also involved with the rugby charity ‘State of Mind’. Now: The Wexford native co-owns a pilates company as well as a wine bar in Dublin. Also writes a weekly column in an Irish newspaper. Like so many of his former team-mates, has popped up in several different media outlets, including ITV. Then: Cornerstone of Ireland’s scrum at tighthead. Now: Another from the team who tends to shy away from the spotlight nowadays, Hayes is a farmer at home in Limerick. His contribution to the Grand Slam success was absolutely pivotal. Now: Dipped his toe further in the coaching world by taking on a role as forwards coach with Stade Francais. O’Connell continues to maintain that he hasn’t yet committed to coaching long-term but he will always be held in high regard in this country. Like O’Gara, logic suggests that he will end up back in Ireland as a coach – if that is the path he opts to pursue. Now: O’Driscoll has wasted no time in adapting to life as a media powerhouse as he is a regular contributor to Newstalk’s Off The Ball, as well as BT Sport and ITV’s rugby coverage. Ireland’s leading try scorer co-owns rugby website Ultimate Rugby and is also an ambassadors for HSBC, which sees him pop up around the world at sevens events. Away from the oval ball, O’Driscoll is a senior advisor with Teneo and is an investor in Glendalough Whiskey. Now: Could still be playing now if his career wasn’t ended by a spate of injuries. Ferris is a regular pundit who has featured on RTE, BBC and Newstalk. Now: Recently a contestant on Dancing with the Stars, just like his rival on the 2009 team – Tomas O’Leary. Stringer has shown him himself to be a shrewd analyst with his work on Eir Sport and Virgin Media. Then: The seemingly indestructible No 8. Now: Heaslip always had one eye on life after rugby, which came in handy when he was forced into early retirement last year. A tech investor, performance consultant and company director, he has certainly kept himself busy. Heaslip also does a bit as a pundit, where he features on Channel 4’s Champions Cup coverage. Now: Often appears on Virgin Media’s rugby coverage, which ties in nicely with his weekly column in the Munster Rugby supplement in the Irish Independent. Wallace is a regional manager with Bank of Ireland and a director with Special Olympics Ireland as well having owned a sweet shop in Limerick. Now: Ireland’s most successful captain will lead his country out for the final time in the Six Nations this afternoon. Best will hang up his boots at the end of the World Cup but until then, he still has a major role to play in Ireland’s hopes of advancing to a first semi-final in Japan. One suspects that life on the farm – his other life-long passion – beckons. Now: Recently became Leicester Tigers head coach and after a rocky start, seems to have steadied the ship for now at least. Murphy faces a big rebuilding job at his second home. Now: Owner of Home Instead Senior Care in Cork, where he has focused much of his attention after opting out of coaching with Munster. Now: Often appears on BBC, he set up the Paddy Wallace fund for autism and a rugby academy in Belfast, while also working as a business consultant. Now: The Cork native is making rapid progress in the coaching world as he broke new ground for an Irish coach to land one of the top job’s in Super Rugby. O’Gara (pictured) helped Crusaders to the title in his first season working as backs coach, which came on the back of a successful stint in Paris with Racing 92. His next step will be interesting as there will be a job back home in Ireland whenever he feels ready to make that inevitable move. Now: Apart from appearing on Dancing with the Stars, O’Leary has largely kept a low profile in the public domain. He owns a watch company, Told & Co, while he also went back playing GAA with his local club in Cork after ending his playing career in France with Montpellier. Now: Regularly pops up on TG4’s rugby coverage as a touchline analyst and interviewer. Horan spent time coaching Shannon in the AIL before moving into a player development role with Munster and LIT as well as working with Rugby Players Ireland. Then: Key component of the engine room. Now: O’Callaghan has kept his feet firmly in the game since retiring last year as he works as a pundit with both Eir Sport and BT Sport. The Cork man writes a weekly column and does tremendous work in his role as a Unicef ambassador. Then: Powerful impact back-row replacement. Now: Another whose career was cut short by a serious injury, Leamy now juggles his time as a farmer and a coach with Clonmel RFC. Now: Spent time working at Arsenal as a strength and conditioning coach before taking a leap of faith in becoming Munster’s scrum coach. Flannery’s reputation continues to be enhanced as he furthers his experience on the other side of the white line. He also owns a pub in Limerick and is a director at Maximum Media.